Weed management is one of the top priorities for corn and soybean growers. Weed management is one of the top priorities for corn and soybean growers. Each year, the choices available for products and timing of use become more complex. 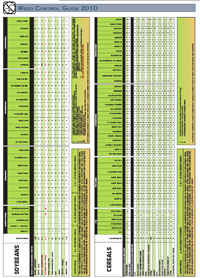 To simplify the decision-making process and to provide a handy reference tool, offers this annual Weed Control Guide. 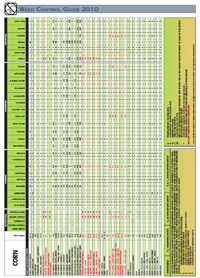 As mentioned in past weed guides, an important feature of these tables is the chemical group column. Using this, growers can quickly check the group their product or tank-mix options belong to, making it an important first step in managing the development of herbicide resistance in weeds, with the potential for rotating products with different modes of action. We are grateful to Mike Cowbrough, OMAFRA’s weed management specialist, for reviewing the Top Crop Manager Weed Control Guide and making numerous helpful suggestions. Product suppliers also have been of assistance in keeping the guide up-to-date. 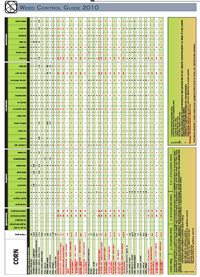 We have made the tables as user friendly and as concise as possible. Remember though, it is a guide adapted from OMAFRA’s Publication 75, and is not a definitive text. 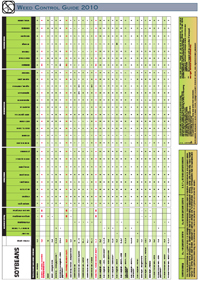 Growers should always double-check provincial guides and product labels to avoid errors The Top Crop Manager Weed Control Guide is laid out with products listed for each crop by trade name and in alphabetical order with major grassy weed products listed first, then major broadleaf products, then the tank-mix partners, and finally products that are solely for herbicide-tolerant crops. 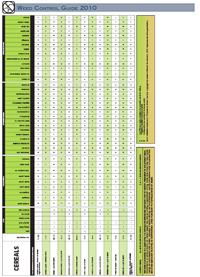 This format allows growers to compare their options of grassy weed and broadleaf weed products, and then, after making their choice, to take the second step of comparing the tank-mix choices and picking one that best tackles their grassy and broadleaf weed spectrum. 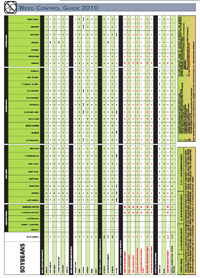 Product ratings for each weed are the same as in Publication 75, and tank-mix ratings are based on the better rating for each weed attributed to the products in the tank-mix. In some cases, the ratings of efficacy for a product may differ from one application timing to another. Note that this guide includes only one rating. 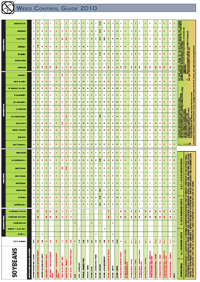 The ratings provided in the tables should be used as a guide when selecting herbicides. Growers should be aware that the actual control obtained can vary greatly depending on a variety of parameters, including soil type, moisture conditions, weed pressure, weed size and environmental conditions. 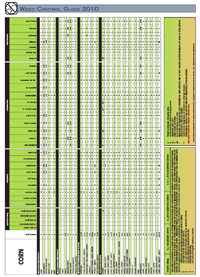 Again, we stress that the information contained in the tables is derived from OMAFRA’s Publication 75 and we strongly suggest that growers check the publication and use the product labels for details and cross-reference. Each year, new products are introduced and some are withdrawn from the market. However, due to publication lead-time conflicting with confirmation of registration for new products, we may not have been able to include all of them. We suggest readers make a suitable note in their copy of the tables as new products are introduced.